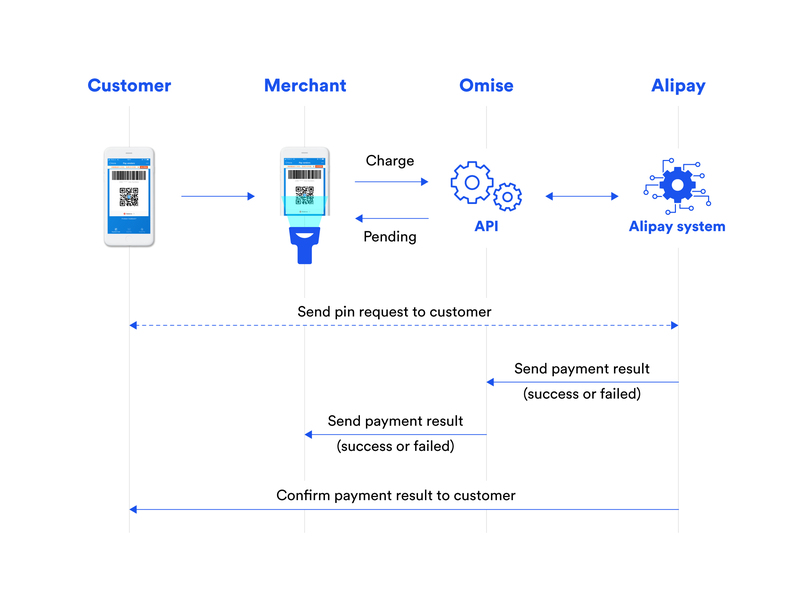 The following flow diagram covers the series of system interactions that occur between the customer, the merchant, Omise and Alipay in a typical offline Alipay transaction. When the payee is ready to checkout, they open their Alipay application. They then click the "Pay" button to generate a unique barcode. To accept payments, the merchant scans the barcode. The merchant's server then creates a charge through an API call sent to the Charge API. The merchant receives a response. This will include the charge status, which at this stage, is marked pending. In some cases, the payee may be required to confirm the payment on their Alipay app. To retrieve the lastest charge status, the merchant makes requests to the Charge API. The charge status marked as success indicates that the amount has been sucessfully paid, and the products can be handed over. Timeout - the payee will need to generate a new barcode to recreate the order. Insufficient funds - the payee is advised to choose an alternative payment method or top up their Alipay account. Just like how you would normally create a credit card charge, to create an Alipay charge you also use the Charge API. There are 2 ways of creating a charge. 1. Create a payment source, then create a charge using the source. Regardless of the method you decide to use to create a charge, the result returned will be the same. As mentioned earlier, the status of a newly created charge will always show as pending. To check for the latest status, you need to periodically make the GET request to the Charge API. We will send a webhook (POST) with the latest charge details to the merchant's server as soon as the charge status is changed (either to success or failed). Alipay charges can be refunded in both partial or full amount within 12 months of the transaction date.